Modeled cumulative prostate cancer mortality for WW and RP groups in the absence (A), and presence (B), of PSA screening. Part (A) mimicks the SPCG-4 trial, in which minimal screening occurred. Part (B) models the added effect of screening, and the resulting lead time and overdiagnosis associated with screening, based on the levels of screening observed in the PIVOT trial. Modified from figure in Xia et al. In developed countries, prostate cancer is the most common cancer in men, and is a leading cause of cancer mortality. Prostate cancer treatment is the subject of an ongoing controversy; specifically, whether radical prostatectomy (RP), the surgical removal of the prostate, is associated with better survival than watchful waiting (WW), an alternative approach that delays aggressive treatment until the disease progresses. Two large trials recently investigated whether RP is more effective in preventing prostate cancer mortality than watchful waiting (WW). The Scandinavian Prostate Cancer Group Study Number 4 (SPCG-4) reported a 40% reduced risk of prostate cancer mortality associated with RP (relative risk (RR) 0.62, 95% CI 0.44-0.87), and an absolute mortality difference (AMD) of 6.1% (95% CI 0.2%-12.0%) after 15 years. (This is the difference in the percentage of men who died of prostate cancer, comparing the RP group to the WW group; see red brackets in Figure). In contrast, the Prostate Cancer Intervention Versus Observation Trial (PIVOT) observed a smaller AMD (3%, 95% CI: -1.1-6.5%) and concluded that RP did not significantly reduce all-cause or prostate cancer mortality as compared with WW through at least 12 years of follow-up. The differences in findings between these two trials make interpretation and translation of results difficult. Differences in prostate-specific antigen (PSA) screening practices in the two populations are one possible explanation for the differences in findings. Drs. Jing Xia, Roman Gulati, Ruth Etzioni, and colleagues in Public Health Sciences conducted a study to assess whether certain artifacts of screening, specifically, lead time and overdiagnosis, could explain the differences in findings between PIVOT and SPCG-4. Overdiagnosed cases are those which never would have been diagnosed without screening, and which would not have been fatal. Lead time is the amount of time between detection by screening, to the time that the disease would have been diagnosed in the absence of screening. Both overdiagnosis and lead time can lessen the apparent absolute benefit of treatment, as overdiagnosis results in additional surviving cases, and lead time lengthens the apparent survival time after diagnosis, in both groups (RP and WW). The authors created a simulation model to assess how the effect of RP on prostate cancer mortality observed in SPCG-4 (a population with minimal screening) would be changed if the population had a high background level of screening similar to the PIVOT trial. If the simulation yielded similar results to those observed in the PIVOT trial, it would suggest that the differences in results between the 2 studies were due to artifacts of screening (overdiagnosis and lead time). The simulation model was created as follows: first, a simulation population was created, which had a similar age distribution to the PIVOT case population. This population consisted of cases whose prostate cancer either (a) was not detected by screening (25%), (b) was screen-detected but was overdiagnosed (i.e. wouldn’t have been diagnosed without screening), or (c) was screen-detected but NOT overdiagnosed (i.e. would have been diagnosed eventually even without screening). They used the SPCG-4 study and other studies to estimate 15-year prostate cancer survival in an unscreened population, age-specific prostate cancer survival, lead time (average: 7.7 years), and overdiagnosis rates (32%), which were all assigned to individuals in simulation population groups (b) and (c). 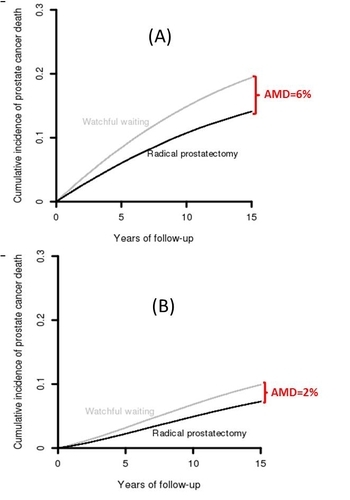 They found that, (see Figure) after essentially inserting the effect of the high rates of screening and screen detection which occurred in the PIVOT trial, the predicted AMD after 12 years was 2.0% (95% CI -1.6-5.6%), which is very similar to PIVOT findings. This suggests that the differences in findings between the 2 studies may have in fact been due to artifacts of high levels of screening (overdiagnosis and lead time) in the PIVOT study. Authors conclude that there is benefit to RP, even in populations with high rates of screening, but the benefit is restricted to a subset of patients (who haven’t yet been identified). PIVOT should not be interpreted as evidence that RP is not efficacious in reducing PC mortality. PIVOT should encourage us to develop tests to identify cases for which immediate treatment is beneficial, noted Dr. Xia. Xia J, Gulati R, Au M, Gore JL, Lin DW, Etzioni R. Effects of Screening on Radical Prostatectomy Efficacy: The Prostate Cancer Intervention Versus Observation Trial. J Natl Cancer Inst. 2013 Feb 14.